@infographic_KSASaudi state-run media’s message to Canada. Saudi Arabia’s state media on Monday tweeted a graphic appearing to show an Air Canada airliner heading toward the Toronto skyline in a way that recalled the September 11, 2001, terrorist attacks. Saudi Arabia expelled Canada’s ambassador after an official account called for the release of detained women’s rights activists in the kingdom. Fifteen of the 19 September 11 hijackers were from Saudi Arabia, and Osama bin Laden, the attacks’ mastermind, was a Saudi citizen who has family there. The Saudi account deleted the tweet and reposted another without the airliner. 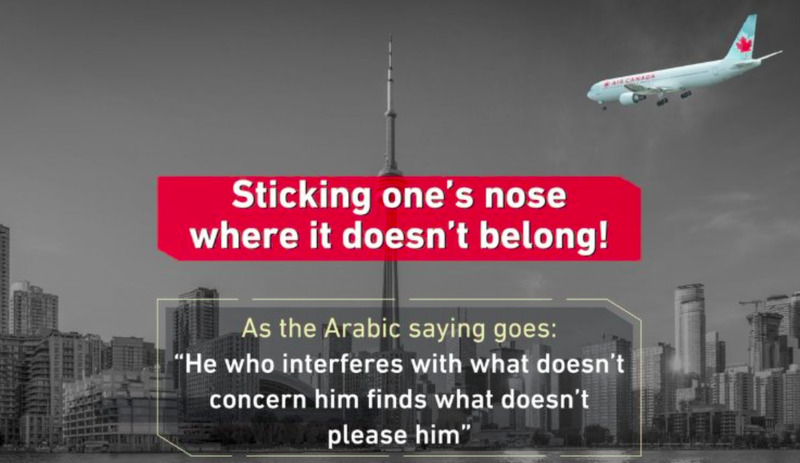 Saudi Arabia’s state media on Monday tweeted a graphic appearing to show an Air Canada airliner heading toward the Toronto skyline in a way that recalled the September 11, 2001, terrorist hijackings of airliners that struck the Twin Towers and the Pentagon. Last week, Global Affairs Canada tweeted that it was “gravely concerned” about a new wave of arrests in the kingdom targeting women’s rights activists and urged their immediate release. Saudi Arabia has expelled Canada’s ambassador and frozen all new trade and investment with Ottawa in response to the criticism. Fifteen of the 19 hijackers in the September 11 attacks were Saudi citizens. The organiser, Osama bin Laden, came from a prominent Saudi family and still has family there. The tweet came from @Infographic_ksa, an account that had just hours earlier tweeted another graphic titled “Death to the dictator” featuring an image of the supreme leader of Iran, Saudi Arabia’s main regional rival. The account says it is a “voluntary non-profit project” but has been described as an official messaging arm of the Saudi government. Saudi Arabia has long stood accused of funding radical Muslim Imams around the world and spreading a violent ideology called Wahhabism. Under the leadership of its new young ruler, Mohammad bin Salman, Saudi Arabia has undertaken several sweeping reforms looking to reduce the funding for and spread of radical ideology as well as to elevate human rights. But a surge of arrests appearing to target prominent women’s rights activists who previously campaigned to abolish Saudi Arabia’s ban on driving for women has caused international alarm and prompted the tweet from Canada. The Saudi account deleted the tweet featuring the graphic with the plane and later reuploaded one without the airliner pictured.